If you are seeking a low-risk way to invest your retirement savings, you may consider an IRA certificate of deposit, often called an IRA CD. Unlike market-based performance IRA products, which are regulated by the Securities and Exchange Commission, IRA CDs are time-based deposit accounts that offer a fixed rate of return along. They also offer the security of being insured by the FDIC up to the maximum legal amount, which was $250,000 as of 2012. Once your CD matures, you may opt to renew it for another term, withdraw the funds, or roll over the balance to another retirement account. When you open an IRA CD, you should receive a hard copy of your certificate of deposit outlining the terms of your account, such as the principal balance, interest rate and maturity date. Your financial institution should also send you written notice when your CD is close to the date of maturity. CDs earn higher interest rates than traditional savings products because the funds are locked into place for a fixed amount of time. This means that unless you don’t mind paying a penalty, changes to your IRA CD are limited to the maturity date and grace period that follows, which is typically between seven and 10 days. If you don't have other investment plans for the funds in your IRA CD, the most common option at maturity is to simply renew the CD for the most advantageous option in terms of the length of time and interest rate. Depending on your financial institution, this can be done in person, over the phone, or online. If you do not contact your financial services company by the end of the grace period to elect your renewal option, your CD will be automatically renewed at the same terms as you had before, or the current terms most similar to them. The downside for this is that, for example, the 36-month promotional CD that you opted for last time may not currently offer as competitive a rate as another option. If you are at least 59 1/2 years of age at the time your CD matures, you may withdraw the money penalty free, but the amount you take out of your account will be treated as regular income and is subject to applicable state and federal taxes. 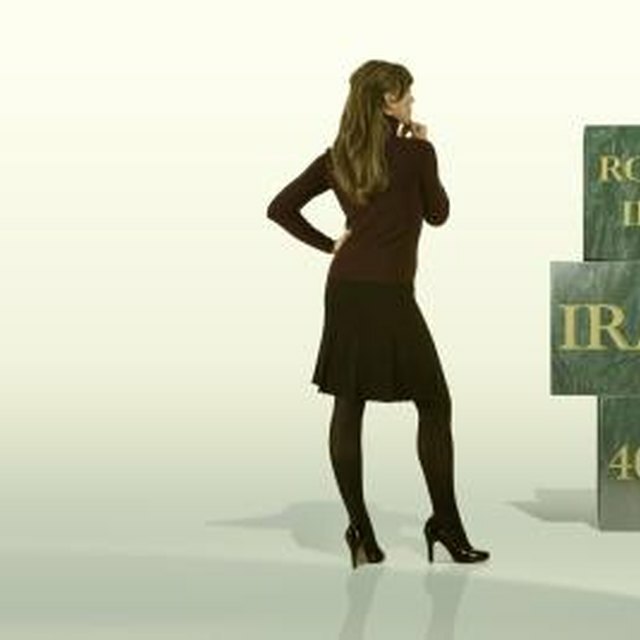 If you have not yet reached the age of 59 1/2 and need to access the funds from your IRA CD, you may still make a withdrawal from your CD on the maturity date, but in addition to income taxes you will also be hit with a 10-percent early withdrawal penalty in accordance with the IRS's early withdrawal rule. Any withdrawals made from a CD that has not yet matured will be assessed a penalty that generally ranges anywhere from 90 to 180 days worth of accrued interest, depending on the CD term and length of time the account has been open. What Will Happen to My TSP When I Quit My Job? After Liquidating an IRA, Can It Be Reinvested Elsewhere to Avoid Taxes? Once your CD matures, you may also opt to roll over the account balance into another qualified retirement account such as a 401(k) or another IRA. Rollovers can be made either directly or indirectly, but both rollover methods must be made within the 60-day time period allowed by the IRS in order to avoid being recognized as a distribution. With direct rollovers, the balance is transferred straight into the new retirement account, while indirect rollovers entail a check being handed to the account holder, made payable to the new financial institution. The account holder then deposits the check into the qualified retirement account within 60 days. Bankrate.com: Forgot About Your Matured CD. Now What?